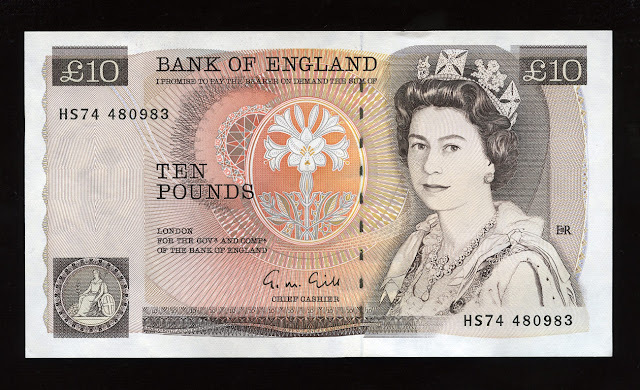 British notes - 10 Pounds, Queen Elizabeth II. 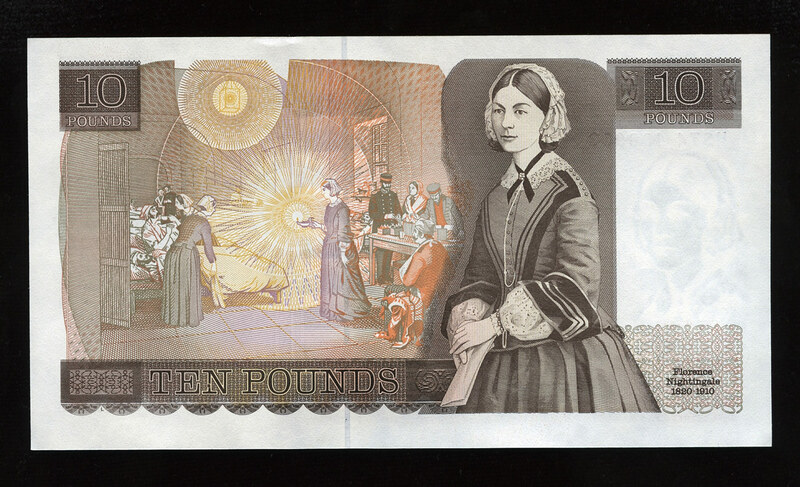 £10 Bank of England note, Florence Nightingale. Obverse: Portrait of Queen Elizabeth II. The Queen is depicted in state robes, wearing the George IV State Diadem, Queen Victoria’s Golden Jubilee necklace and Queen Alexandra’s Cluster Earrings. The necklace was bought from funds donated by the ‘Women of the British Empire’ to celebrate Queen Victoria’s fifty years on the throne. The necklace was presented to Queen Victoria on 24 June 1887. The earrings, created by the jeweller Garrard, were a wedding gift from the future King Edward VII to his bride, Alexandra of Denmark. Reverse: Portrait of Crimean War nurse Florence Nightingale, plus a hospital scene showing her work at the Selimiye Barracks in Scutari as a British army hospital during the Crimean War. Florence Nightingale was known as the "Lady with the lamp" for she was a guiding force in the improvement of sanitary conditions in field hospitals in British military installations in battle locations. After the conclusion of the Crimean War, she became an advocate for improved sanitation in the British military, and also of establishing nursing colleges to train professional nurses. Signature: G. M. Gill - Chief Cashier. Date first issued: 20 February 1975. Date ceased to be legal tender: 20 May 1994.